The bad news is, I’ve got multiple myeloma. The good news, such as it is, is that it looks like it’s the so-called smouldering myeloma variety, AKA dumpster fire in your bones. TLDR: It’s blood cancer. It’s incurable. It’s controllable. I have an early stage. MM normally starts out as MGUS, or monoclonal gammopathy of undetermined significance. MGUS converts to MM at the rate of about 1.5% per year. Mine may have been that way for ten or 15 years, undetected. Since the treatment for MGUS is hide and watch, that was fine. In fact the treatment for smouldering is still hide and watch, but at a somewhat more watchful level. I don’t know much more than that right now. When I get back from Japan, we’ll do a full body MRI and pee in a bottle for 24hrs. Ask me again in October. Not much available on survival statistics for MM, not because it’s an exotic disease, but because doctors are terrible at reporting statistics. The best I can find is that the survival rate for full up MM, untreated, is 7 months. Treated 5yr survival 49% . Assume median (and mean) survival is 60 months. Range is then 7 – 113, StdDev ~ 0.25*range = 28 months. This is not totally accurate, because the curve is not normal, on account of the 0-month wall on the left. The curve is skewed right by an unknown amount. In any event, the clock doesn’t start ticking until the smouldering bursts into flame, and who knows when that will be. Still, I’m dumping my long-term Treasury Notes. I am off to Japan in 12hrs or so, and my responses will be erratic. The family request that all messages of support and condolence be sent to the Democratic National Committee. Summer continues. Trace of rain on Wednesday, otherwise, no rain for going on two months. Highs in the lower 90’sF, lows in the lower 60’sF. 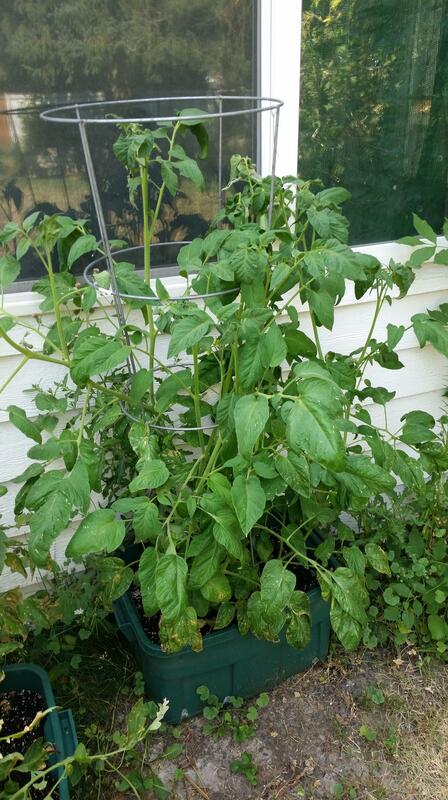 The tomato harvest continues to slow. Eleven this week, totalling less than a kilo. Still having BER problems. Cut down the other Juliet, and the Patio, then moved the Purple Cherokee and the Rutgers up from the south side of the house onto the deck. I am off on a trip the end of next week, and this makes it easier for MJ to water. Besides, we don’t really like the Juliets (tough, acid), and the plants were dying. In other news: Couple of summer squash, and a large, misshapen, Zucchini. Harvested the final cucumber, and took that down. One of the bush buttercups looked harvestable, so I did. The other one is coming along. Looks like the bush variety only produces one per plant. Off on another adventure! It’s another conference, the 6th International Conference on Informatics, Electronics & Vision (ICIEV) & 7th International Symposium in Computational Medical and Health Technology (ISCMHT) in Himeji, on the south coast of the Harima Nada, the eastern part of the Inland Sea. Flying into Kansai International, and out from Haneda. It will be an interesting trip, weather-wise, since I’m doing almost no north-south travel. Right now, the forecast is for highs in the mid 80s, with humidity in the ….. mid 80’s. The flight over takes longer than the travel time inside Japan. I take off from Spokane at 6AM, and land in Kansai at 3PM, the next day. Something, something, Date Line. The plan is to fly into Kansai, and Shinkansen to Himeji, 150km to the west. I’ll have a totally free day (maybe visit Hiroshima, 250km), then half a day at the presentation (also visit Himeji Castle), then another free day (maybe visit Kyoto, 130km). Japan Rail pass all the way. Spend another day in Osaka, and three days in Tokyo, flying out from Haneda. I leave next week, and will update this as I go along. 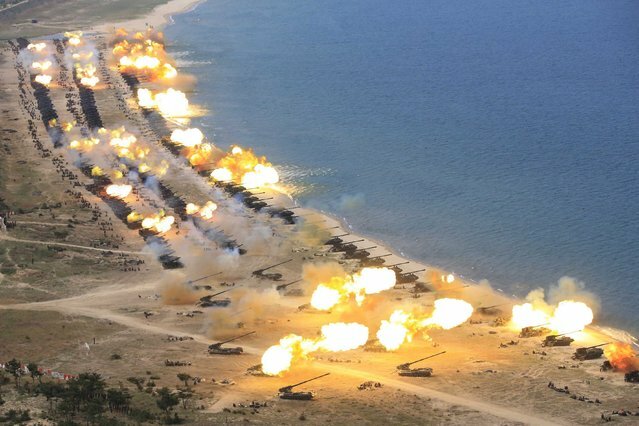 There’s a number of photos out there of a NK artillery exercise, held somewhere along their coast at an unknown date. 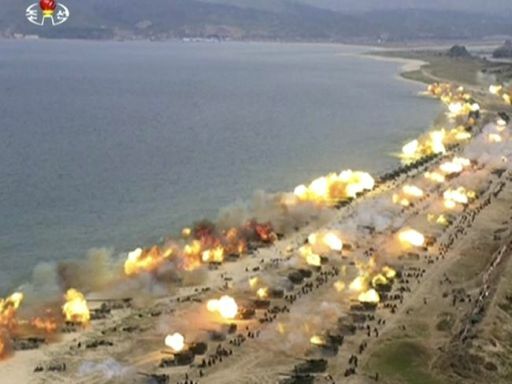 It’s a publicity photo-op, because nobody uses artillery like that any more, do they? 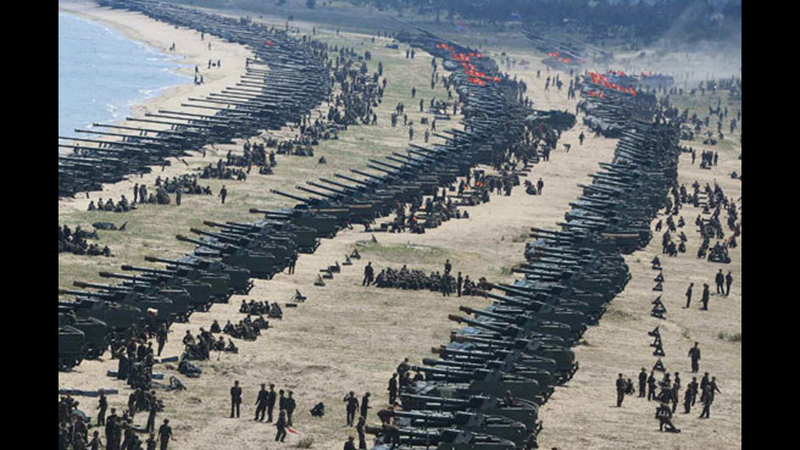 They start off by lining up a hundred or so howitzers and self-propelled guns, hub to hub. The problem is, two thirds of the troops are within 100 meters downrange from that back row. And a third of the troops are within 100 meters of two rows of artillery. Quite aside from the impact on troop hearing, artillery shells have been known to burst on their way out of the tube. This sprays fragments across everybody immediately downrange. Friend of mine from VietNam was still finding microfragments in his body, twenty years after the war. 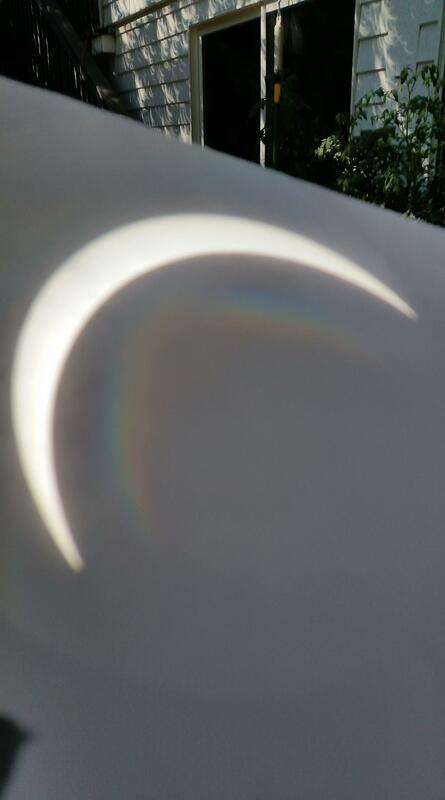 Not wanting to drive eight hours to totality, we stayed in the comfort of our home in the Spokane area and watched the 2017 solar eclipse from our back yard. 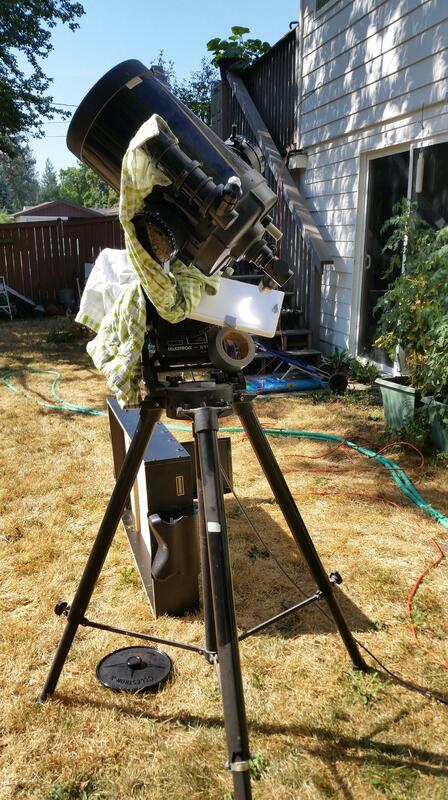 Our watching gear was somewhat patched together: a 20-year-old Celestron 8, a strip of styrofoam with a sheet of paper on it for the projection screen, and an old shirt, to prop up and shadow the styrofoam. 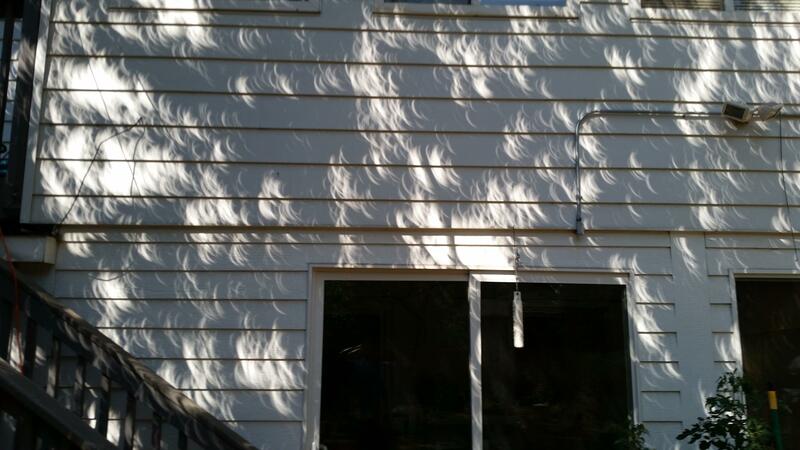 Turns out, you can get a fun view of hundreds of eclipses, by using the natural pinhole cameras from leaves. 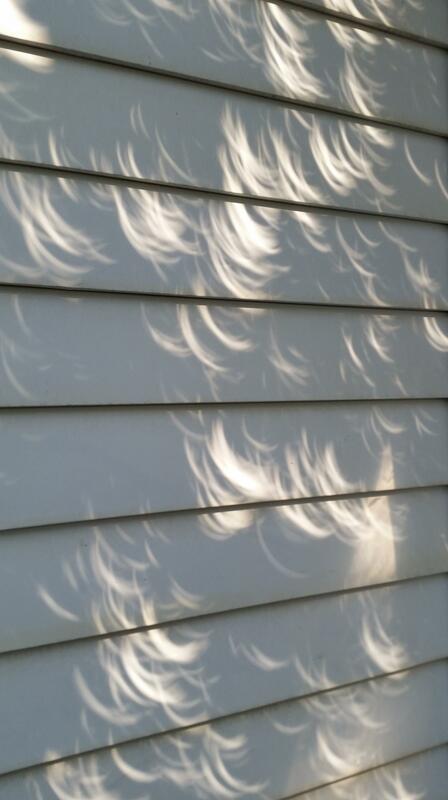 The light had a metallic edge to it, and the temperature dropped from 72F down to 66F. 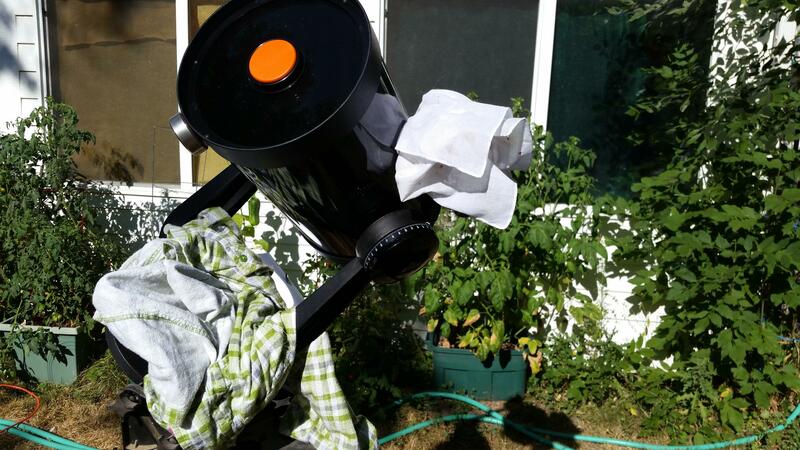 The press said that we’d get 90% of the sun covered in the Spokane region. So, ignoring things like limb-darkening, we were getting about 10% of normal radiation. My question was, where in the Solar System could one find light at this level? The formula is L = 1/D^2, where L is the amount of light compared to the Earth, and D is the distance in Astronomical Units (Earth to Sun distance). 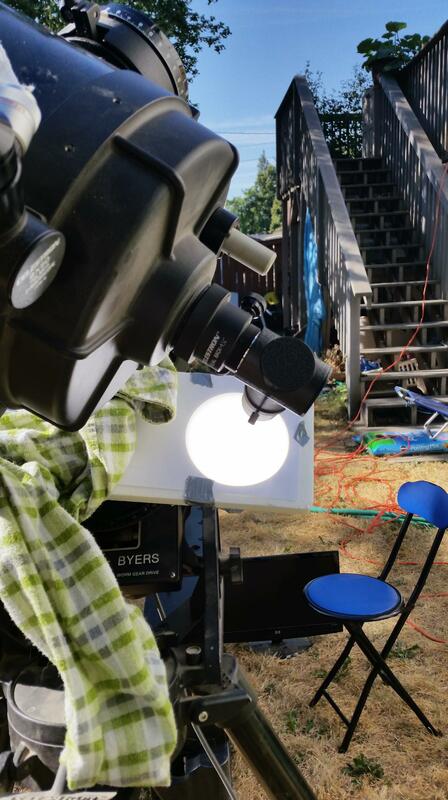 Doing a little bit of algebra to it, we find that the light level near Spokane was about what you would find at 3AU, about the orbital radius of main belt asteroid Ceres. If draining the swamp in DC isn’t working, the obvious alternative is to move deeper into a different quagmire. Trump has announced that we will be playing whack-a-mole with terrorists in Afghanistan for the foreseeable future. So, nothing has changed. We won’t be doing “nation-building”, which is good, because the US Army isn’t trained for that (and doesn’t want to be), and the various State Department entities aren’t funded for it, and it would take a lifetime or longer to complete. Besides, Afghanistan really isn’t a nation. It’s a collection of tribal entities under a handful of local warlords, and the power of the central government doesn’t extend much beyond pistol-shot from Kabul. I almost said corrupt local warlords, but that’s only by our standards. The Afghans have a different view of life and their relation to their leadership. Which brings up another point. 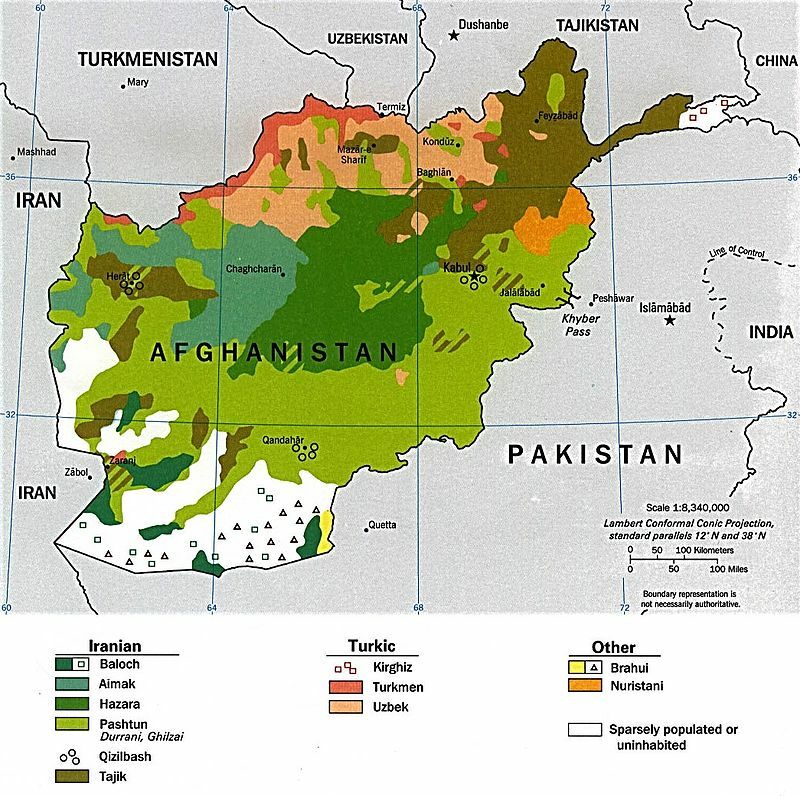 Afghan loyalties run family, then tribe, then, weakly, region, with national coming in a long way out of the running. Why does this matter? Because it matters to them. The primary social interaction between communities in Afghanistan may well be the blood feud. Think Hatfields and McCoys, writ large and decades long. You kill my cousin and you have made blood enemies of every person in our extended family. Every terrorist is somebody’s cousin. Or brother. Maybe the Taliban core leadership is from elsewhere, but everybody surrounding them is local. You put a drone through the window of a Taliban headquarters and you kill leader A, who will soon be replaced. You also kill locals B through K, who have cousins. It will never end. The Soviets were a lot more callous than we are about civilian casualties and collateral damage, and they couldn’t do it. A final point. Trump has said we will not be announcing troop numbers. That policy will be of limited use, and will mostly work to our detriment. Why? Because the Afghan government will know how many troops we are moving in and out of their country, if for no other reason than they provide most of the on-the-ground logistical support. And if the Afghan government knows, the Taliban knows. To make the chain a little longer, if the Afghan government knows, then the Pakistani intelligence services know (and metric tons of our support comes through Pakistani ports), and if the Pakistani intelligence services know, then the Taliban knows. You know who won’t know? The American people, the press and the taxpayers and the voters. This is not a way to provide OPSEC, it’s a way to hide the magnitude of the upcoming losses. Summer continues. No rain for over a month and a half. Highs in the lower 90’sF, lows in the lower 60’sF. Next week we’ll have highs around 80F with lows around 55F. Possible rain, but not enough to keep down the blowing dust. The tomato harvest is slowing. Twenty this week, totalling a mere 1.5kg. None of them very big. Cut down one of the deck Juliets. Was starting to go yellow, and we don’t really like them anyway — too small for their tough skin. Maybe use them in broth. In other news: Two medium summer squash. I’m going to leave the Buttercups for a while. Likewise the purple cabbages — they are producing tiny heads, with no signs of bolting. We had corn on the cob last night. One cob each. They were pretty well gnawed but they still had some kernels on them, and I wondered if they’d make a good broth. Prep was nothing special: two leftover cobs with enough water to cover (just over a quart), along with a couple pinches of salt. Pressure cook on high for 45min. Setup: 1/3 cup of stone ground rolled oats, one cup of corn broth, two dinner teaspoons of potato flakes, salt. Cook for 10 minutes or so, depending on the exact style of oats. Add the potatoes at the end. Results: Very good. The plain broth was surprisingly foamy when heated, but the mild flavor carried over, and blended well with the flavor of the oatmeal itself. UPDATE: Be sure to drain your cobs afterwards. They will absorb up to 45g of water, each, and then drip it into the garbage can if you don’t. The search that just won’t die. 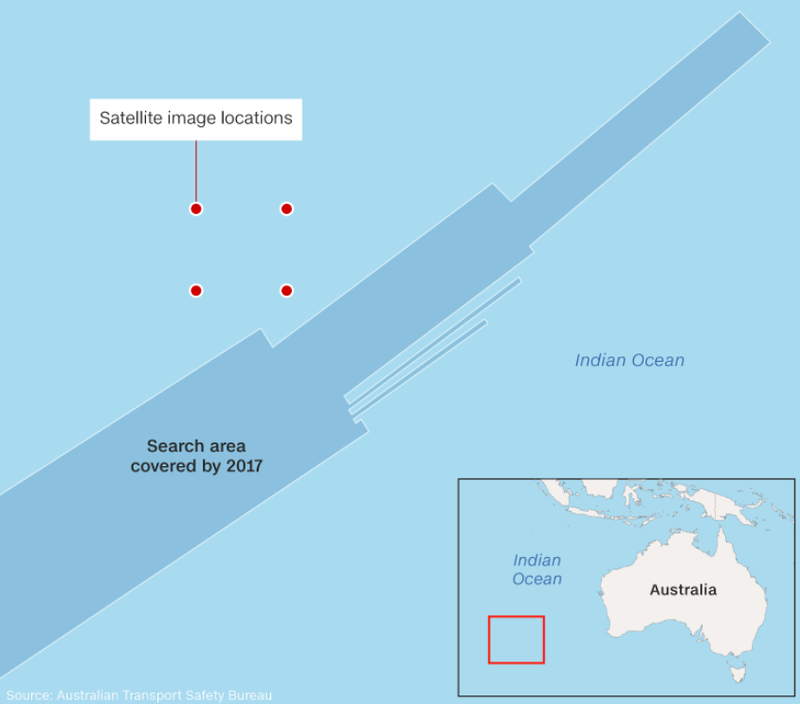 Just over three years ago I talked about using satellite imagery to search for debris from the MH-370 crash site. 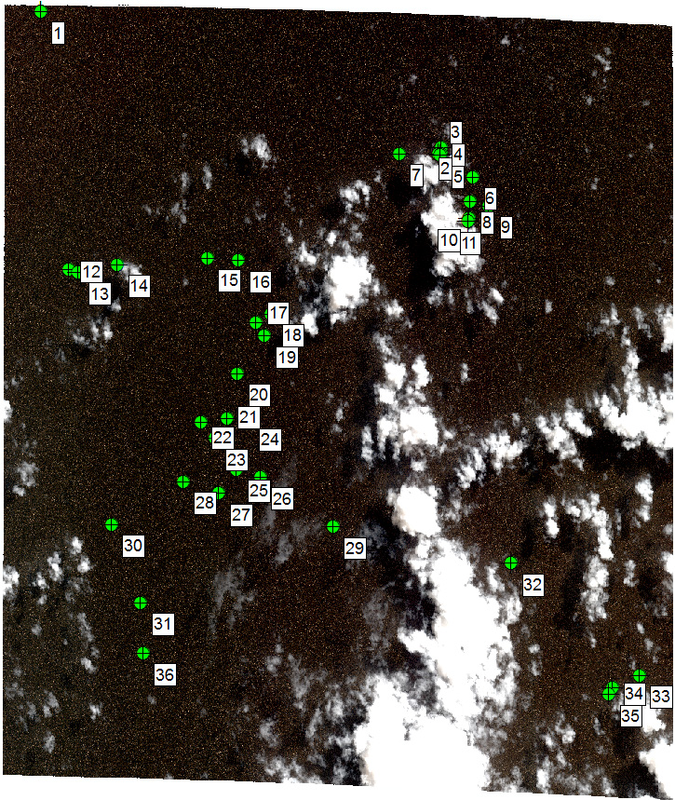 Now, a reanalysis of all imagery available has shown more debris, including some items big enough to be from the aircraft. The imagery was obtained two weeks after the crash, and so had been moving at the whim of the wind and the currents. Detailed drift analysis gives some idea of where the debris could have ended up. The map doesn’t show tracks, it shows calculated possible final locations, with error bars, from a starting point on the white line, just outside the search area. You will note a dense cluster of them in the vicinity of PH-04, the upper right square. The problem is, of course, that the imagery isn’t good enough to tell what the floating objects are. Even with Principal Component Analysis image enhancement. The imagery analysis report can be found here (pdf), and the full file of ATSB reports here. This new evidence might not be enough to re-start an already expensive search, but it will certainly prompt an intense scrutiny of the sonar recordings from that edge of the search box. Summer continues. No rain for over a month. Highs in the upper 90’sF, lows in the lower 60’sF. Next week we’ll have highs around 80F with lows around 55F. Possible rain, but not enough to keep down the blowing dust. 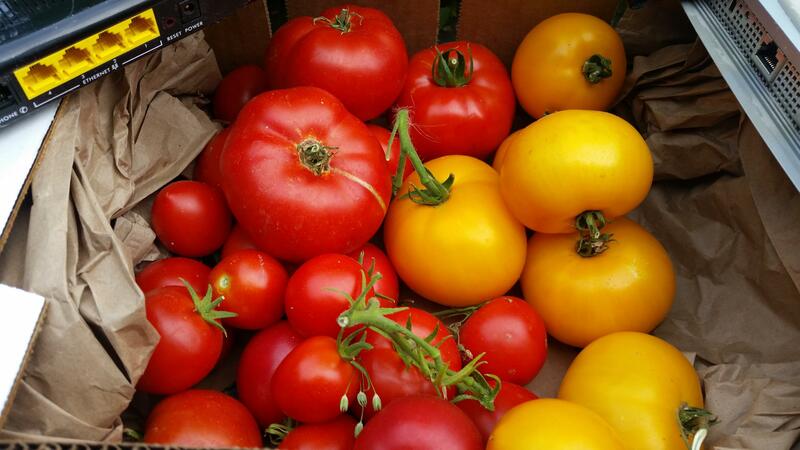 The tomato harvest is starting. Thirty this week, totalling 4kg. Champion and Lemon Boy are producing some nice ~200g tomatoes, while First Lady and Arkansas Traveller have smaller ones. Cherokee Purple and Beefmaster still bothered by BER. In other news: Two more cucumbers. Two medium summer squash. One of the Buttercups will be ready to harvest soon. Last year at this time we had 5.5kg of non-cabbage produce. This year, roughly 9kg. Summer continues. No rain for over a month. Highs in the upper 90’sF, lows in the lower 60’sF. 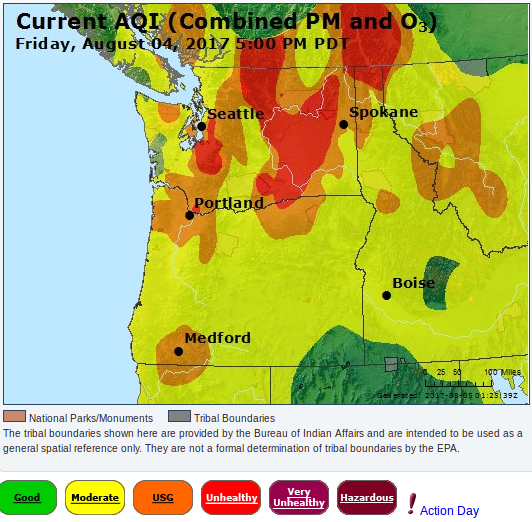 They were forecasting 100F, but we didn’t make it, thanks to a smoke blanket that made our air worse than Beijing’s. Big Boy gave a couple of 150g’s, and the Beefmaster gave a 100g tomato (the first that wasn’t et up with BER), and there’s more buckets of cherry tomatoes of various types. Meanwhile, the Pink Brandywine by the house isn’t doing anything. Maybe the shock of almost drowning made it reluctant to reproduce. I note, though, that the one in the main garden is only now producing flowers, so it might just be a (puts on sunglasses) late bloomer. In other news: Two cucumbers, one big, one small. The Bush Buttercup is trying to produce something, but it really needs to be in a bigger pot. 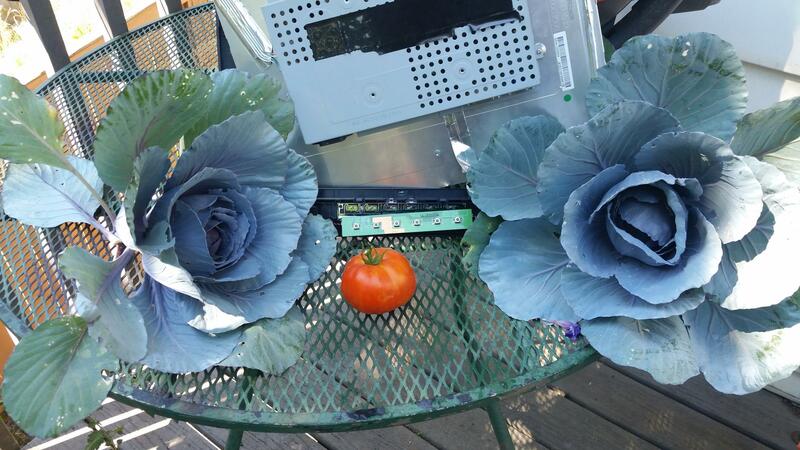 Harvested two of the purple cabbages. Trimmed, they are fist sized, and about 125g each — and were very tough, even when shredded and cooked with Spam, peas, and carrots . There’s three left, and we’ll see what the heat does to them. Last year at this time we had almost 4kg of non-cabbage produce. This year, just over 3kg. 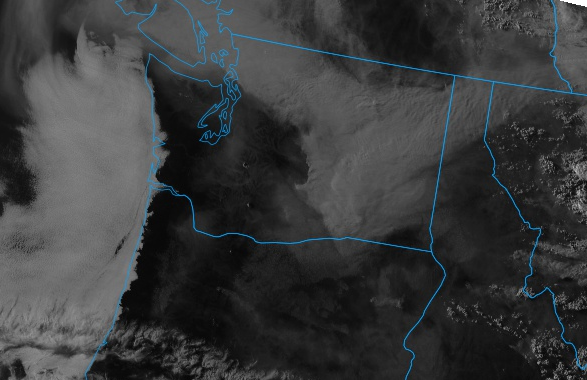 I am always amazed at how far smoke can travel. 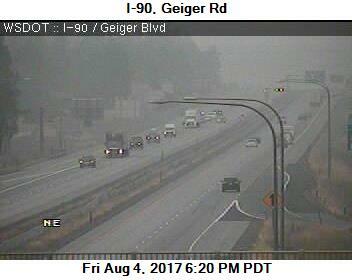 Lots of fires up in British Columbia, lots of BC smoke in the Spokane area. Right now our AQI is 193. In Beijing, it’s 45. Judging from the map, it will only get worse here. Out on our back deck, it takes the form of a light haze. You can smell the smoke, and your eyes water. I guess we keep the house closed up tonight. UPDATE: Was still too smoky to open up, even at 11PM. 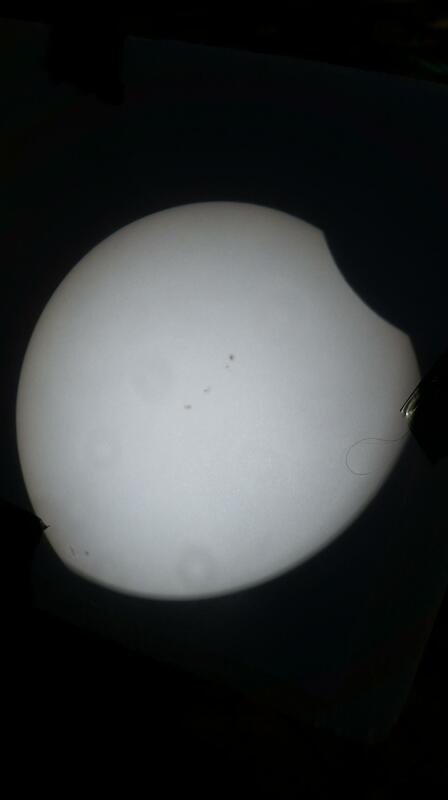 3/4 moon was a nice bright orange. I’d write a haiku, but I can’t think of a rhyme. I’m not a big one for spicy. I can eat spicy food, but I don’t seek it out. Usually. This week, MJ bought some Colby-Pepper-Jack cheese snacks. Smallish sticks of cheese with chunks of jalapenos embedded in them. Mediocre snacks, because of the too much peppers. That didn’t keep me from eating them. And it didn’t keep me from trying them in oatmeal. Setup: 1/3 cup of stone ground rolled oats, one cup of beef broth, two dinner teaspoons of potato flakes, salt. Grab handful of CPJ sticks, call it a quarter cup. Cook for 10 minutes or so, depending on the exact style of oats. Add the potatoes at the end, and the cheese right before that. Results: Not quite as mediocre. The cheese melted nicely and the pepper bite got spread out, but the pepper smell/flavor remained.